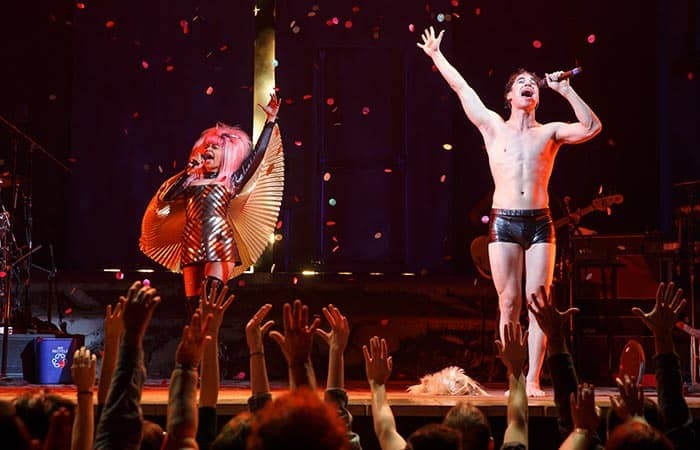 Get your Hedwig and the Angry Inch on Broadway tickets before you travel to New York. It’s easy to buy your theatre tickets online, and it’ll save you time. Hedwig and the Angry Inch tells the story of Hedwig Robinson, a transgender woman from East Berlin and lead singer of a rock band. The musical is a remake of the 1998 off-Broadway version, at that time created and played by John Cameron Mitchell. In 2001 the musical was made into a movie, this film has been nominated for a Golden Globe. The music, a fiery mix of punk, rock and pop, is written by Stephen Trask. 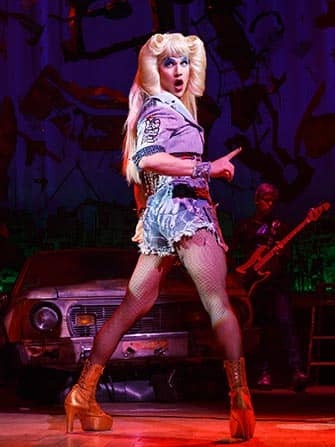 After the 2014 Broadway show premiere, Hedwig and the Angry Inch has been nominated for eight Tony Awards with four actual wins. The musical has attracted various famous actors to play the leading role. The decor consists of remnants of ‘Hurt Locker: The Musical’ or so the story goes. The musical version of the famous movie is said to have ended after just one show. The stage resembles an Iraqi war zone after the invasion, with the remains of a bombed car taking centre stage. 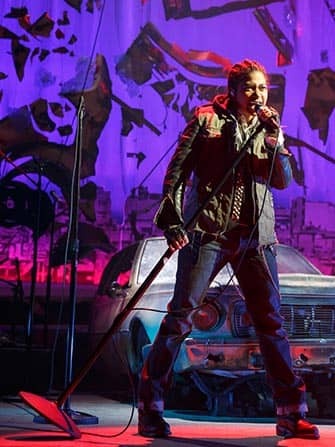 Perhaps you’ll even find a program of this non-existent musical under your seat, since Hedwig and the Angry Inch’s director went all out to create a realistic setting, including the ‘official’ Hurt Locker programmes. The band doesn’t look like a true rock band due to all makeup and wigs, but the music isn’t anything short of a real punk rock concert. The songs are intense, but well performed. Rolling Stone Magazine even claimed it to be the best rock ‘n’ roll musical ever. Both Hedwig and her shy husband Yitzhak, played by a woman, sing catchy songs like their lives depend on it. They are the only two actors in the musical and are only accompanied by some band members. How to buy Hedwig and the Angry Inch on Broadway Tickets? It is easy to buy tickets for Hedwig and the Angry Inch with the link below. I recommend buying tickets online before your trip to New York. You will save time and you don’t have to stress about finding tickets when you are in New York. A lot of Broadway musicals are very popular and are often sold out. I recommend to book your tickets through the website below. There is no service fee and free shipping (on e-tickets) or you can pick up your Broadway tickets locally. Inappropriate for 16 and under, due to strong language and mature themes, children under the age of 4 are not permitted in the theatre.